In terms of goals kicked, Matthew Richardson is the most successful forward to come out of Tasmania after the great Peter Hudson. Born in Devonport to former Richmond premiership ruck-rover Alan ‘Bull’ Richardson, Matthew started his football journey with the Devonport Magpies as a 17-year-old in 1992. Unlike his 184cm father who played predominantly as a ruck-rover, the junior Richardson was a young giant, standing 197cm and seemingly destined for a career as a key forward. After only one season in the north-west Richardson was recruited by Richmond as a father-son selection at Pick 4 in the 1992 pre-Draft selections draft, making his senior debut with the Tigers in 1993 in Round 7 against St. Kilda at the MCG. It was a debut to remember, with the young Richardson gathering 20 disposals and slotting a goal in a 32-point Richmond victory. Three weeks later, in just his fourth game, Richardson dominated a disappointing Sydney outfit, gathering 23 disposals, kicking 6.3, and – in a sign of things to come – pulling in an astonishing 14 marks, a performance that earned the young Richardson an AFL Rising Star nomination. He finished his debut season with another outstanding display, booting 7.1 and taking 13 marks against the Saints at Waverly. The AFL community – in an era of superstar goal kickers – was heralding the arrival of the next big thing. Richardson’s 1994 season started where the previous season had left off. He booted bags of 8.1 and 7.2 in his opening two matches, and while he didn’t rise to those heights again during the season he finished the year with a hefty tally of 56, more than staking his claim as Richmond’s number one forward target for the next decade. Unfortunately, 1995 was the year in which the injuries that were to plague his career first developed. Having started the season in great form with 27 goals from his first eight games, Richardson hyper-extended his left knee whilst trying to avoid falling into the fence at the SCG, tearing his anterior cruciate ligament and requiring reconstructive surgery that ended his season. He returned in 1996 better than ever, producing the best season of his entire career in terms of goal return, booting an impressive 91.49 from 22 games. He finished third on the Coleman Medal table behind Tony Lockett and Jason Dunstall and earned the first of his three All-Australian guernseys. Solid seasons between 1997 and 1999 – 55 games for 169 goals – led into a 2000 season where the Tigers were expected to seriously challenge for a finals berth. But again injuries would intervene, with Richardson playing only three games in 2000 after suffering a rare foot injury known as a lisfranc rupture that required surgery and forced him to miss the rest of the year. Richardson would later describe it as “probably the worst injury I had in my career”. Without Richardson the Tigers fell short of a finals appearance, finishing ninth. 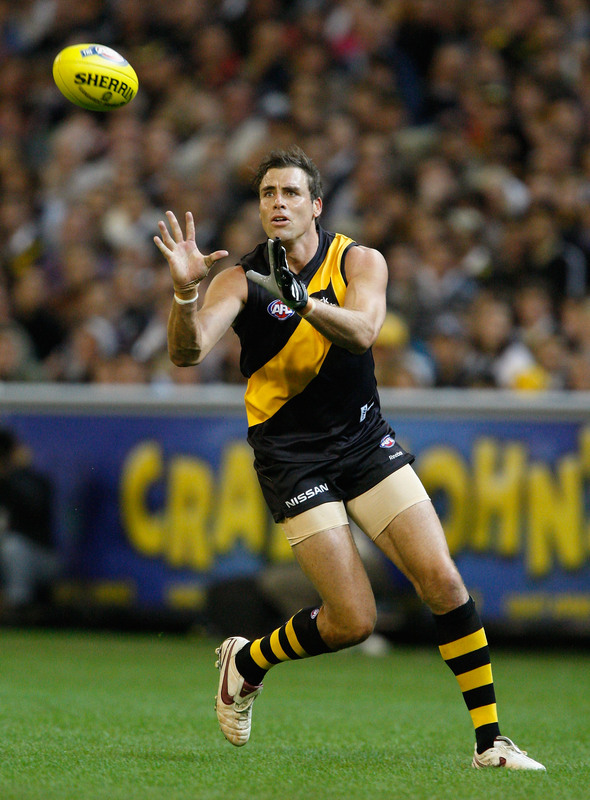 Back to full fitness in 2001, Richardson was one of only five players to top 50 goals for the season (59) as Richmond stormed into their second finals series in 19 years. Richardson played a key role in the Tigers barnstorming semi-final win over Carlton before the club fell to a dominant Brisbane side in a preliminary final at the GABBA. After a comparatively lean 2002-03 period Richardson was back to his best by 2004, securing a haul of 65 goals that included his first and only career haul of 10, achieved against the Western Bulldogs in Round 8. Despite having turned 30 Richardson showed no signs of slowing down from 2005-2008, with season tallies of 64, 45, 53 and 48 proving that the old warhorse still had plenty left to offer. Indeed, many observers regard 2008 as his finest season. He spent much of the year on a wing, dominating matches to such an extent that he finished third in that year’s Brownlow Medal count, with many saying that had he won it, he would have been amongst the most popular Brownlow Medallists of all time. After confidently declaring early in 2009 that he would like to play on into 2010, injury struck a devastating – and ultimately final – blow to Richardson’s illustrious career. After kicking his eight hundredth career goal against Sydney at the SCG in Round 6, Richardson partially ripped his hamstring off the bone, requiring season-ending surgery, and at year’s end he announced his retirement from AFL football. Richardson’s record at Richmond is matched by very few over the club’s long history. His 800 goals are bettered only by Jack Titus’ 970, while his 282 games position him sixth of all-time behind legendary names such as Bartlett, Dyer and Bourke. Post-retirement, Richardson has become a popular and knowledgeable member of the AFL media, with stints on Channel 10 and Channel 7 television in addition to providing special comments for radio station 3AW. At his best, Richardson was a player of unparalleled athleticism and talent. Excellent speed off the mark, an outstanding pair of hands and a kick for goal that is often unfairly derided all made him one of the great key forwards of his era. Between 1995 and 2010 only Matthew Lloyd of Essendon kicked more goals than Richardson’s 713, and his goals per game average of 2.84 surpasses that of fellow superstar forwards Wayne Carey and Bernie Quinlan. Matthew Richardson made an enormous contribution not only to the Richmond Football Club over his 17-year career but to the national game as a whole. His achievements have been recognised by his induction into the Richmond and Tasmanian ‘Team of the Century’ as well both the Tasmanian and Australian Football Halls of Fame.